Scenario: You’re inviting friends and family over for a dinner party, only to realize that your cousin Jenny is a vegetarian. The original dishes you had planned on making all have meat in them, leaving you in a tight situation. Do you simply stick to your original plans and let her deal with her own dietary restrictions? Accommodating for guests with varying dietary preferences can be intimidating, but it’s not as difficult as you think. With a little planning and further knowledge, you’ll be well on your way to hosting the best dinner party ever. Cousin Jenny will be happy, too. Let’s dive in. 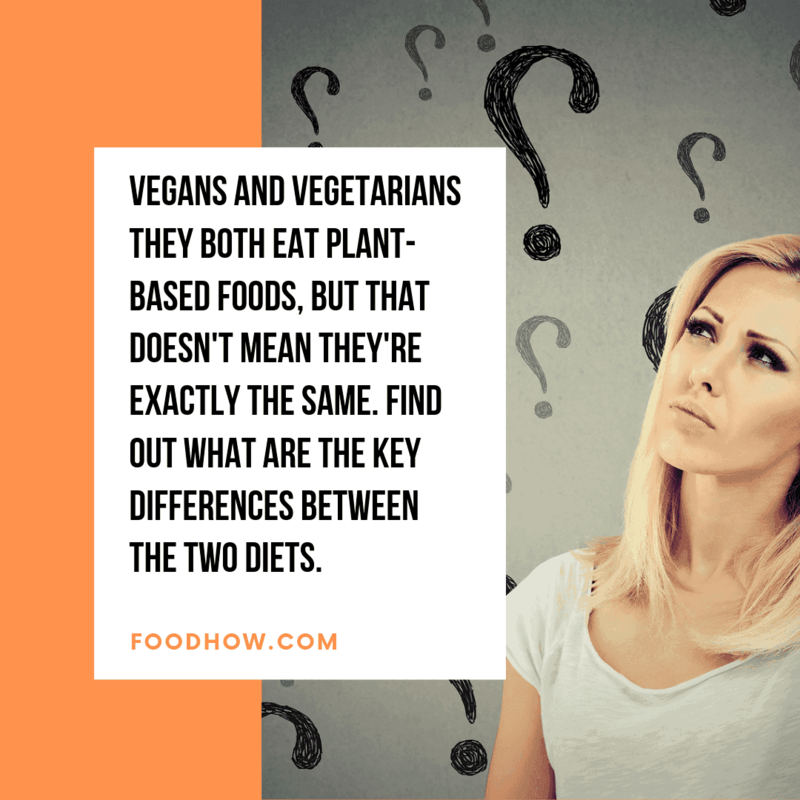 Vegan Vs. Vegetarian: What’s the Difference? 1. Be open-minded and discerning. 2. Learn about your guest’s preferences. 3. Check out different vegetarian food ideas and recipes. 4. Keep your dining table organized. How Can You Cook For Vegetarians And Meat Eaters At The Same Time? By now, you’ve probably heard the words “vegan” and “vegetarian”. Is the term “vegan” just a shortened version of the word “vegetarianism”? Not quite. Let’s get this out of the way– veganism and vegetarianism are not the same things. Related, yes, but not the same. Think of it this way: Veganism is a stricter sub-category of vegetarianism. A vegetarian diet excludes meat, poultry, and seafood from their diet. However, they still consume/use many products that come from animals, such as eggs, cheese, honey, milk and leather. Vegans also exclude meat, poultry, and seafood from their diet. However, they take it a step even further by completely eliminating their use of all animal foods or products. This means that they don’t consume/use eggs, milk, honey, leather, or any other products that come from animals. As you can see, veganism is the stricter sub-category of vegetarianism. Since cousin Jenny is vegetarian, you can still use eggs, cheese, milk, honey, and some other ingredients. Not so bad, right? Dinner doesn’t have to be so hard after all. First of all, relax. Now that you have a good idea of what a vegetarian is and is not, planning shouldn’t nearly seem as hard. The basic idea is you just have to have a few dishes that don’t contain any meat, poultry, or seafood in them. Yes, salads are super healthy and vegetarian-friendly, but if I was invited and I knew that’s the only dish you had for me, I’d just stay home. Include a salad, but there are also many other dishes you can make. It’s time to get creative. Vegetarians become vegetarian for many reasons, not just out of compassion for animals. ​Some other reasons why vegetarians choose to be vegetarian include deep and long-held personal beliefs, health concerns or doctor’s orders, food allergies or intolerances, or even a son or daughter’s rebellion against eating meat. So when or if you address the topic of cousin Jenny’s vegetarianism, do so with softness and an open mind. Some people are literally fighting for their lives, and vegetarianism may be one of the ways their doing so. If you’re not too sure about something, it’s best to ask your vegetarian guest. ​Some vegetarians may have more or less strict dietary preferences than mentioned above, so it’s important to be inquisitive and ask them directly. Keep in mind that 99.999% of vegetarian guests want to help you accommodate their needs versus letting you struggle with the decisions on your own. They might even offer to help out in the kitchen or bring a dish to the party. Don’t take this as an insult– they are simply trying to make your life easier. Don’t assume your vegetarian guest wants a tofu turkey. ​When omnivores think of vegetarian food, more often than not they picture imitation meat products. Yes, they might actually be craving a tofu turkey, but most of the time vegetarians eat wholesome foods, such as vegetables, fruit, eggs, cheese, and other dairy products. Again if you’re not sure what cousin Jenny wants, just ask. Your vegetarian guest most likely doesn’t want to have their food or utensils touching meat or other fleshy foods. For one, if your guest has been vegetarian for a very long time, they might actually experience discomfort if they consume any grease, fat, or meat products. Others simply don’t prefer not to. To make this an easy process, keep separate utensils for each menu item at dinner. Also, keep all the vegetarian dishes close to each other on the table, that way utensils from other dishes are less likely to be dropped in the vegetarian dishes. Uncle Edgar might pick on or tease Cousin Jenny since he’s anti-vegetarian. For some reason, some people enjoy picking on vegans and vegetarians for their dietary preferences. In most cases it’s simply lighthearted in nature, but there are some people out there who are really against vegetarianism. If you know that Uncle Edgar is anti-vegetarian, plan seating arrangements ahead of time. You can seat them at opposite ends of the table and not facing each other to make things easier. If you’d like, you can go a step further and talk to both of them to make sure they don’t have any confrontation at the table. Yes, now it’s time to plan what you’re going to cook for the dinner party. You now know what the difference is between a vegetarian and a vegan, and you now know what to consider in planning for your vegetarian guest. So how can you cook for a vegetarian and meat eaters at the same time? Here are some options that will make it easy for you. Serve menu items that can act as either a side dish or a main entree. For example, rice and beans or a vegetarian pasta are great side dishes as well as main entrees. 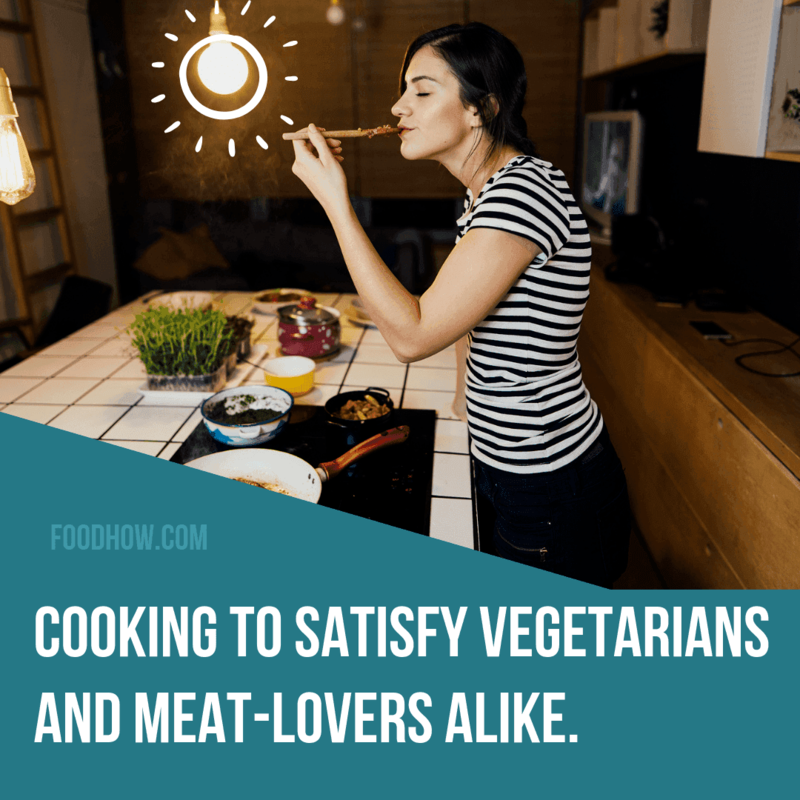 If you’re making a dish that usually contains meat and is vegetarian otherwise, simply cook and serve the meat separately from the rest of the dish. A great example of this is spaghetti. Your vegetarian guest(s) can eat the spaghetti noodles and pasta sauce, and your meat-eating guests can eat the same thing along with meatballs. 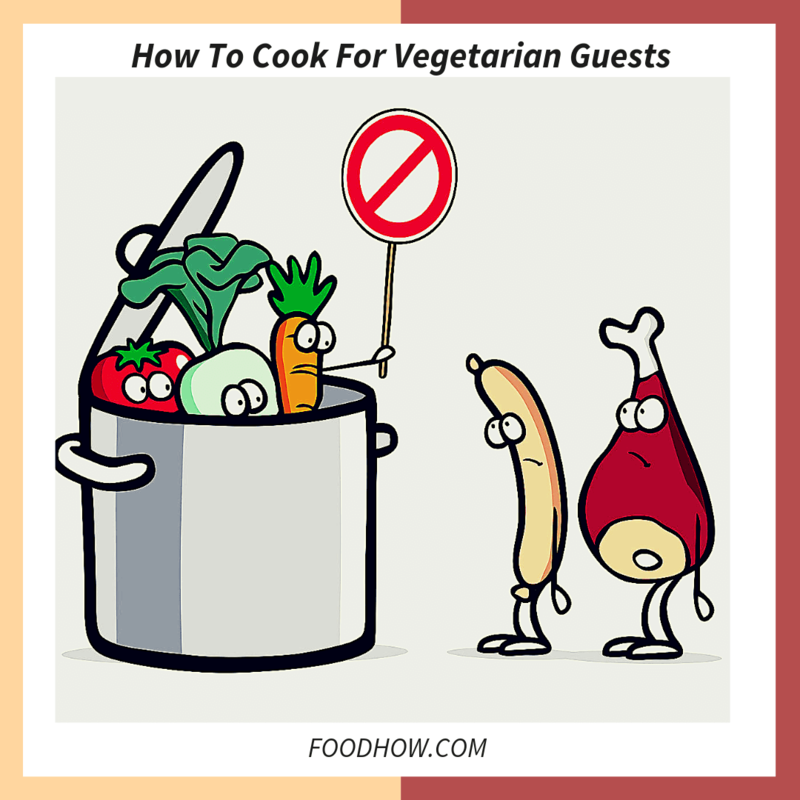 Make completely separate dishes that are designated for your vegetarian guest. This is probably the most time-consuming yet creative option. If you’re adventurous in the kitchen, perhaps now is the best time to try a new vegetarian recipe you’ve seen on the internet. There will be no confusion on which dish if vegetarian, and your vegetarian guest will thank you for it. Cook a “build your own” dinner. ​You can prepare a lot of vegetarian and non-vegetarian ingredients, and let your guests create their own dinner. This may sound like a disaster waiting to happen, but trust me it’s not. A great example of a “build your own” dinner is tacos. Simply line up all the ingredients in separate bowls, and let people make their tacos– vegetarian or with meat– as they please. And there you have it! You now know what a vegetarian eats, things to consider, and some great ideas on how to serve both your vegetarian guest and meat-eaters. As you can see, serving a vegetarian isn’t so hard after all. Hopefully, you found this article useful and perhaps it’ll even encourage you to explore vegetarian for yourself! If you do decide to cook tofu after all and you have no clue what to do with this white block of sponge then you should watch this video. Here you will learn some clever tips and trick for how to make tofu taste and look like chicken. And even if you are not planning to prepare tofu for dinner this video is still really entertaining to watch. Now I would like to hear from you. Have you hosted a dinner part where you had to cook vegetarian and meat dishes at the same time? How did it go? Do you have any advice? Or if you are a vegetarian, have you had any interesting experiences and/or advice you could share? Comment below, I would love to hear from you. Nutritionists, researchers, and writers, interested in everything healthy-living related. Helping you identify the best diets, learn about food and nutrition, to help you live happier, longer and stronger. Instead of cooking Tofu I would recommend cooking Tempeh, which is actually a product of soybeans that is made by fermenting cooked soybeans and compressing them into a thick block, which can then be sliced and fried or cooked according to preference. It actually contains more fiber and protein than tofu and is easier to digest since it is fermented. Tempeh is a very popular meat substitute since it can be cooked in many ways similar to meat. Try it as a substitute for chicken nuggets, sandwich meat, or sweet and sour chicken. You can expect to receive 20 grams of protein per 100-gram serving. I am not actually vegan nor vegetarian but I do have a lot of vegan friends and I do invite them over for dinner and I cook for them and they have all told me that they prefer Tempeh instead of Tofu. But I guess it also depends how you cook them. We are having a dinner party and you just saved me. All I could think of was vegetables and I knew that wasn’t enough. I feel like I have a ton of ideas now. Build-your-own dinners have worked well for me in the past, as when my brother was dating a sweet vegetarian girl, and I seem to also remember that she favored it when we had plenty of yummy vegetarian sides. I was always a little worried that she wouldn’t get enough protein, but as long as we made sure there was a big spinach salad (which we all liked to eat, anyway!) she was happy. We don’t use soy-based products (there are several hormonal disorders in the house and soy just messes all of us up so bad) but we often do homemade black bean burgers, or grilled cheese with bacon and tomato for the omnivores and grilled peppers + tomatoes for vegetarian friends. Usually asking them what would be easiest works; most of my vegetarian friends are worried about putting other people out and will happily provide suggestions. 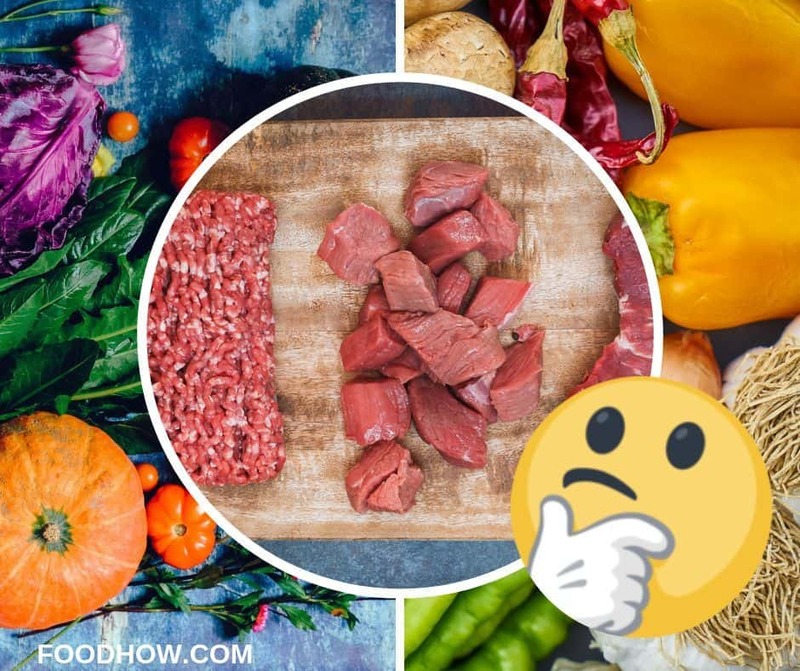 FoodHow.com is to inform, inspire, encourage and engage all the readers to make healthy and informed choices when it comes to food, cooking, diet and nutrition. 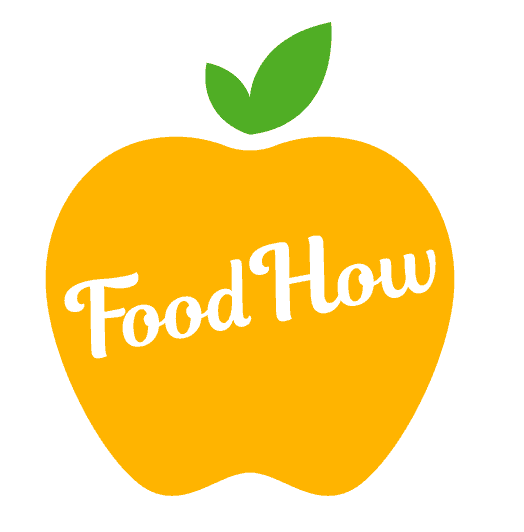 FoodHow.com is a participant in the Amazon Services LLC Associates Program, an affiliate advertising program designed to provide a means for sites to earn advertising fees by advertising and linking to Amazon.com We also participate in affiliate programs with Clickbank, CJ and other sites. FoodHow.com is compensated for referring traffic and business to these companies.